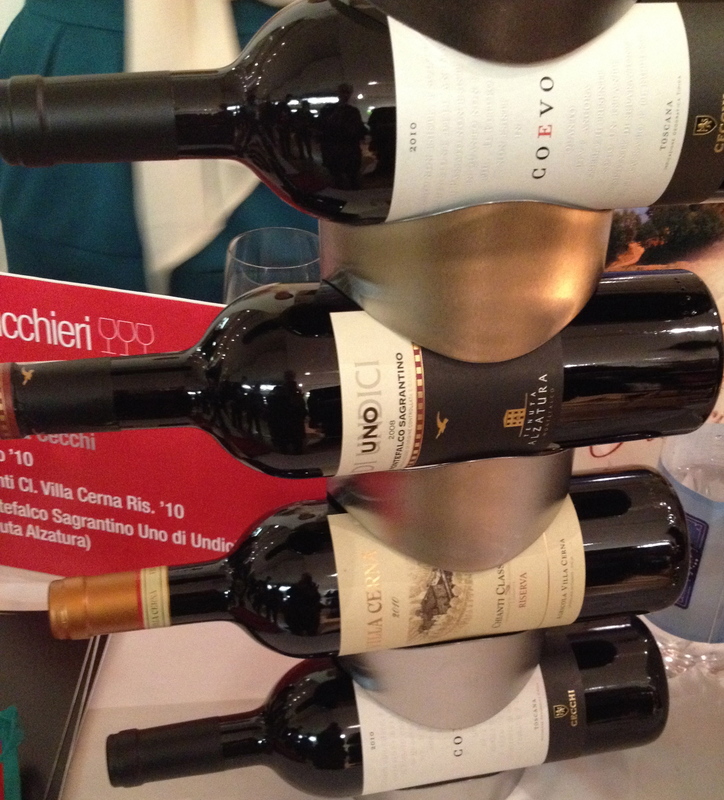 Walking around the Gambero Rosso Tre Bicchieri Tasting, an annual event, I was pleased to see a number of wines that I like that were chosen for their highest award. A little background on this first winery. When I was the wine director for I Trulli Restaurant in NYC, I went every year to Vinitaly, the wine fair in Verona, with Nicola the owner of the restaurant. We became friendly with a producer from Friuli and always visited him. 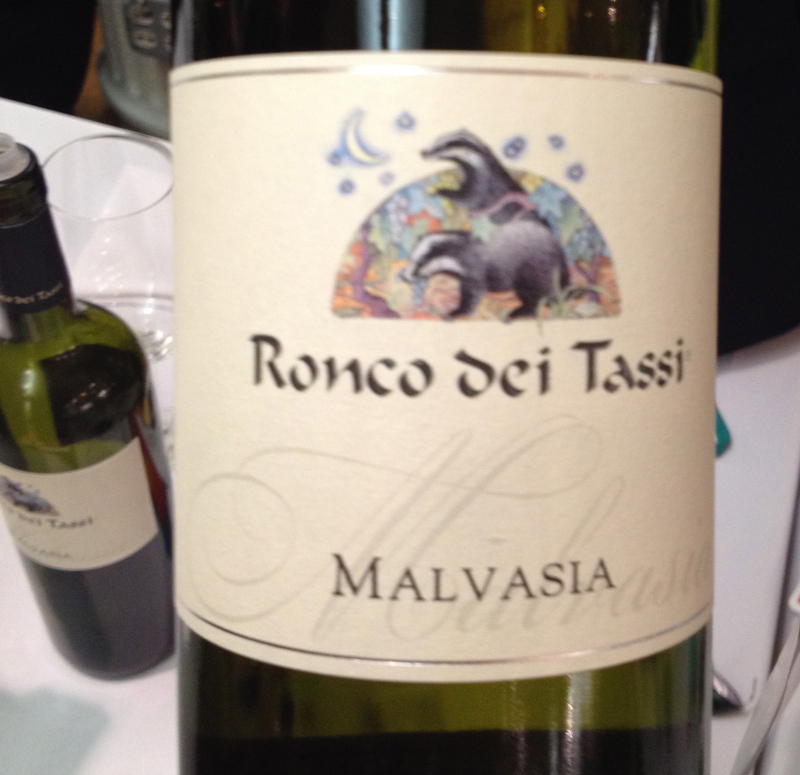 He shared his booth with another producer from Friuli, Ronco dei Tassi. The Coser Family, who owned Ronco dei Tassi, were very nice and we would also taste their wines. However, it was embarrassing because we did not like the wine. This went on for a few years. Then one year we tried the wines and were amazed at how good they had become! We tasted through their entire line and liked them so much that Nicola decided to import them. Today they are among the best wines made in Friuli. There are 1.2 acres of 60-year old vines 650 feet above sea level in the heart of the Collio zone near Cormons. After a vigorous selection and soft pressing, the wine is fermented in temperature controlled stainless steel tanks using selected yeasts. The wine is bottled in the spring 6 months after the harvest. There are only 3,000 bottles produced. 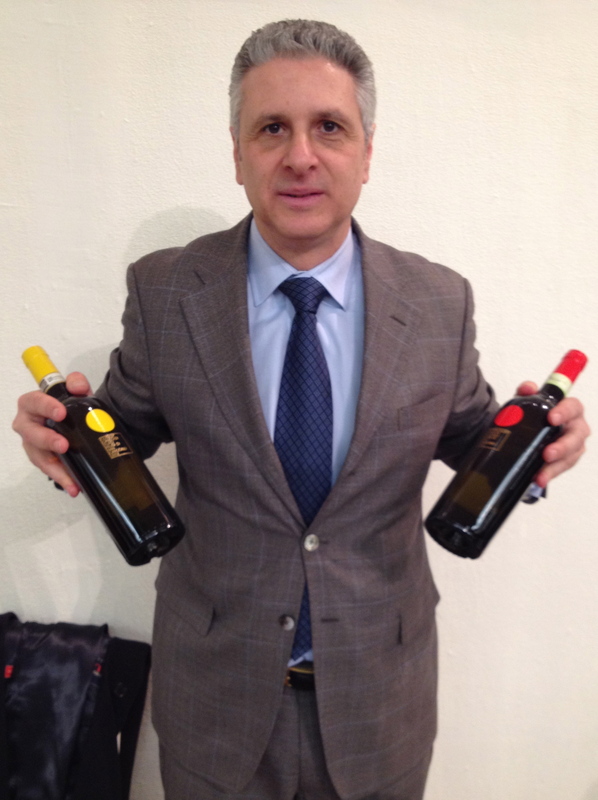 As I was walking around I saw Maurizio de Rosa, North American representative for Feudi Di San Gregorio pouring wines. I had not spoken to Maurizio in some time and stopped to catch up and to taste the wines. I always enjoy speaking to Maurizio because he is very knowledgeable on the subject of Italian wines, the wines of Campania and Taurasi in particular. 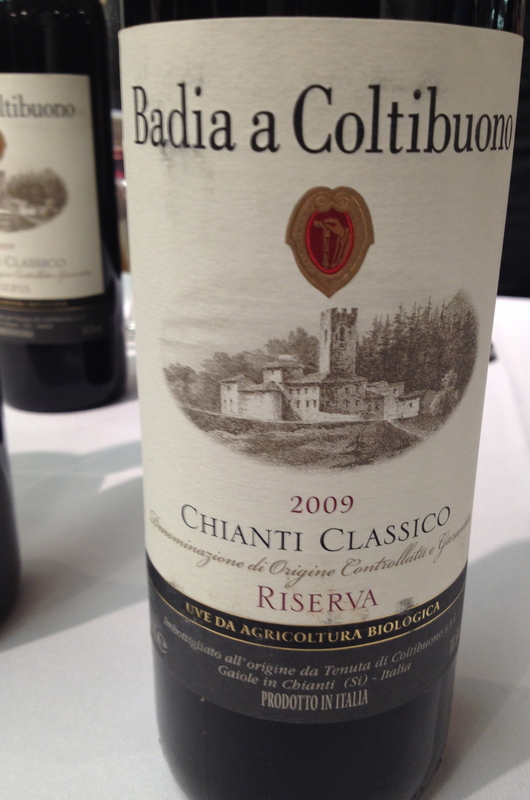 Chianti Classico Estate Riserva 2009 DOCG Badia a Coltibuono (Tuscany) made from 90% Sangiovese and 10% Canaiolo. I first went to the winery in 1983 and remember drinking the 1978 Chianti Classico Riserva at the restaurant on the property. I have been drinking it ever since. 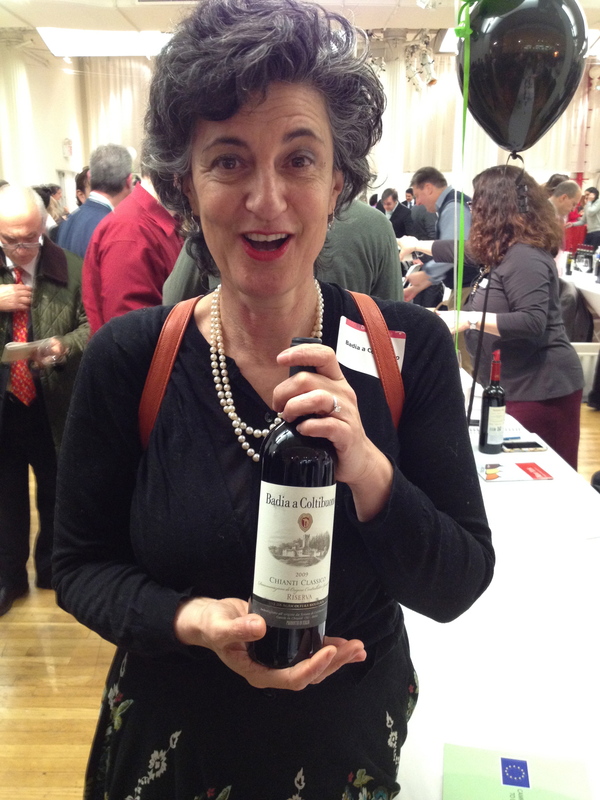 Emanuela Stucchi Prinetti was pouring her wines and I see her often at tasting in NYC. The grapes are organically grown and vinified using natural yeast. The winery has minimal environmental impact, they use gravity flow, manual grape sorting, and the destemmed fruit goes to the fermentation tanks and vats for separate vinification. There is a piston cap punch-down system and maturation is mostly in large casks and not in small barrels. I first met Alfredo and Luciana Currado owners of the Vietti winery in 1981 when I went to visit them. We became good friends and I saw them often in Italy and in NY. The winery is now in the capable hands of their son Luca. The vineyard is in Castiglione Falletto and has a south/southwest exposure. The average age of the vines is 37 years. After alcoholic fermentation in stainless steel tanks for 19 days, the wine is macerated on the skins for a total of 33 days. The wine is then immediately transferred into small barrels to undergo malolactic fermentation. It is then aged for a period of time in 30HL casks. The wine is bottled without filtration. I have been a big fan of the Cogno-Marcarini wines ever since Sheldon Wasserman introduced me to them. Elvio Cogno now has his own winery and the winemaker is his very talented son-in-law Walter Fassore. Walter makes traditional classic Barolo. I have visited the winery a number of times and have met with Walter here in NYC. Made from a sub-variety of Nebbiolo called Lampia. The vineyard is 300 meters above sea level with 5000 vines per hectare and faces southward. The grapes are from the finest vineyards in Novello, in the most historic part of the Ravera cru. Harvest is in October. Fermentation in stainless steel temperature controlled tanks with pumping over and 30 days maceration with submerged cap. It is aged for 24 months in large Slovenian oak barrels 25/30 HL. It remains on the lees for 90 days and spends12 months in bottle before it is released. 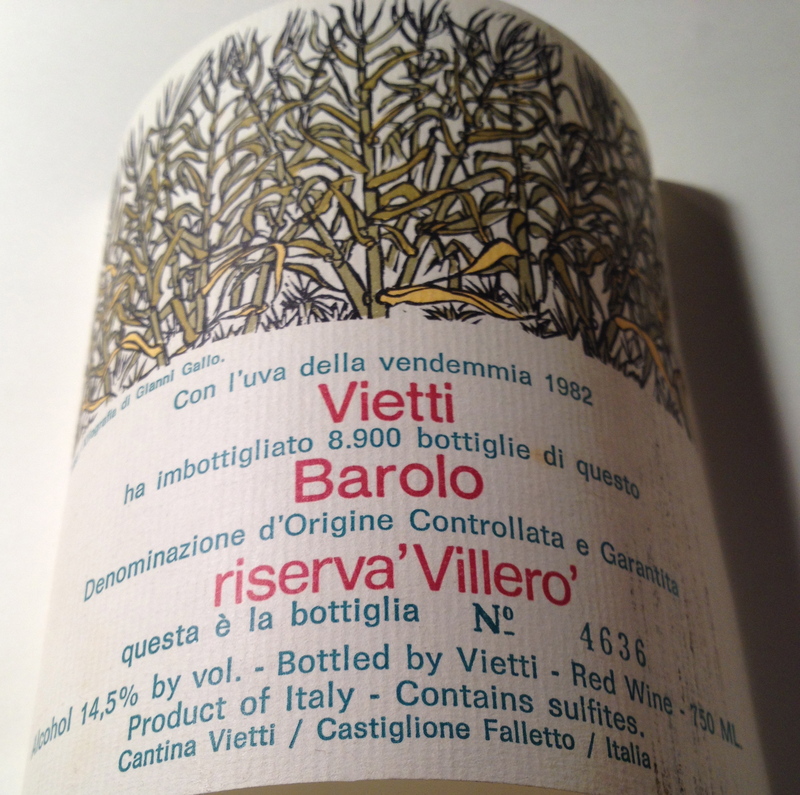 This is a classic, traditional Barolo; well structured and elegant and is going to need a lot of time to develop. Someone I have known for a number of years and enjoy seeing and talking to is the very personable Andrea Cecchi. We always have discussions on the changing wine scene in Tuscany and what is going on in the American market. 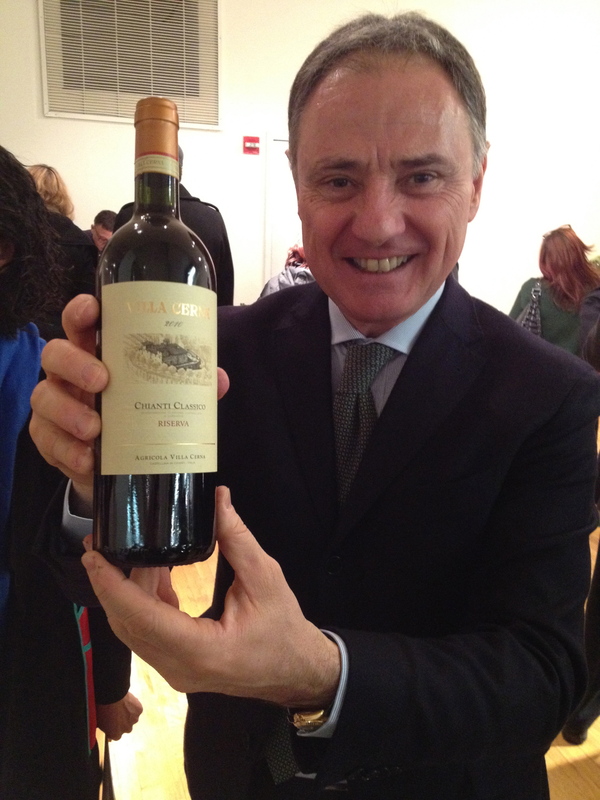 He was very pleased when I told him that Coevo was a Super Tuscan I could drink and enjoy. The area of production is Castellina in Chianti, for the Sangiovese and Cabernet Sauvignon and the Maremma Toscana for the Merlot and the Petit Verdot. Made from 60% Sangiovese, 10% Cabernet Sauvignon, 15% Merlot and 15% Petit Verdot. At Castellina in Chianti the vineyards were at 200mt and in the Maremma at 250mt. The soil and climate are very different in these two regions and certain grapes did better in different zones. Fermentation is in temperature controlled stainless steel tanks. The alcoholic fermentation takes place with the skins. Maceration is for 3 weeks for the Cabernet Sauvignon and 2 weeks for the Merlot and Sangiovese. The wine is aged in barriques and tonneaux for 18 months and in bottle for 12 months before release. There is no sign of vanilla or over concentration, the calling cards of Super Tuscans. 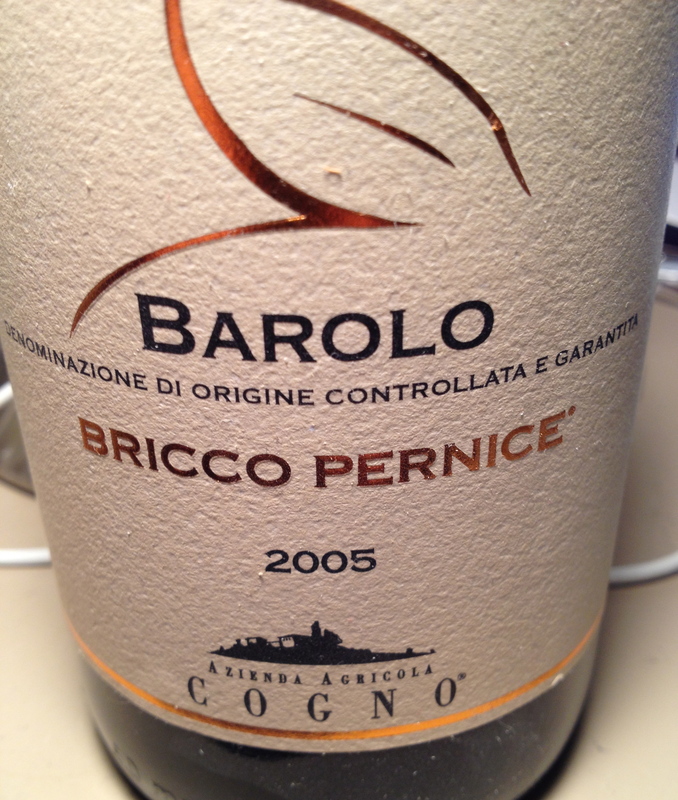 It is a balanced, elegant wine with red fruit, violet and earthy aromas and flavors and a hint of pepper. It has a long finish and pleasing aftertaste. The wine needs a few more years to develop. Charles: Very nice lineup of wines and I loved your descriptions. 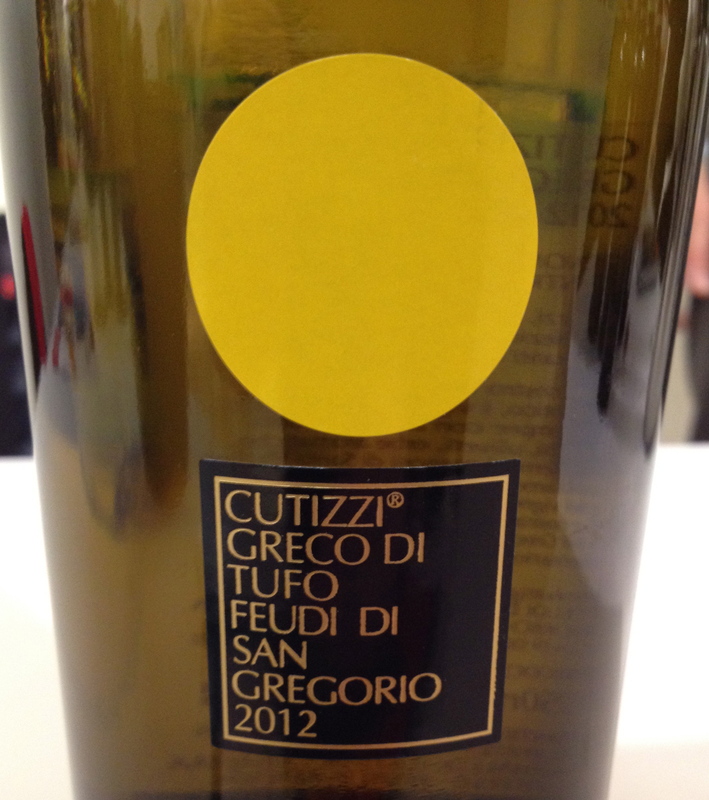 I couldn’t agree with you more regarding the Feudi di San Gregorio Greco di Tufo “Cutizzi” 2012 – a marvelous wine!